Beopjusa one of Korea's oldest and greatest Buddhist temples, founded in 553 C.E., has been active for more than 1400 years. The name of the temple means "Buddha stays here." Situated on the slopes of Songnisan ('renouncing the world') mountain (within Songnisan National Park), at times during its history Beopjusa has been home to more than 3,000 monks. Since the eighth century, the temple has been designated as central temple for worship and teaching of the Maitreya Buddha, the Buddha of the future who will return to save the world. In recent times, Beopjusa has become known for its 33-meter-tall gold statue of the Maitreya Buddha. Golden Maitreya Statue, 33 meters tall. 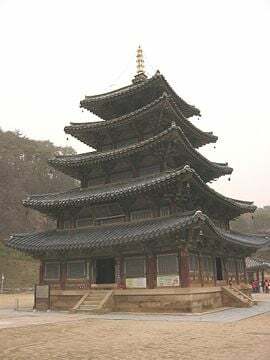 Beopjusa founded in 553 C.E., in the Shilla Kingdom during the fourteenth year of King Jinheung's reign, just 24 years after Buddhism was first introduced to the Silla Kingdom, temple construction began under the leadership of the monk Uisinchosa. In 776, monks Jinpyo and Youngshim gained the patronage of King Hyegong, and the temple flourished. In the Goryeo dynasty, as many as 3,000 monks practiced and lived in Beopjusa. Some of the original structures from 653 still stand on the temple grounds, including a cistern and iron pot for serving food and water to thousands of monks. Beopjusa thrived as a center for the Jogye Order until the Joseon Dynasty. By the middle of the Joseon Dynasty, the complex contained more than 60 buldings and 70 hermitages, or individual meditation cottages. However, almost of them burned to the ground during the Japanese invasion of 1592, but, as the Confucian Joseon court refused to support the Buddhist temples, more than 30 years passed before reconstruction began in 1624, under abbot Byeokam. In its history, Beopjusa has undergone reconstruction eight times, including a major nationwide reconstruction in 1851. None of the original buildings remain. From its early days, Beopjusa has been associated with Beopsang thought and the worship of the Maitreya Buddha—the Buddha who is to come. It is predicted that thousands, even millions of years after Sakyumini's death the Maitreya will come to earth from the spiritual realm where he currently resides. Living with mankind on the earth, he will deliver three important messages, the Three Yonghwa Sermons. Mankind will unite in worship of the Maitreya, live according to the teachings in the Three Yonghwa Sermons and commit acts of goodness, thus securing their salvation. 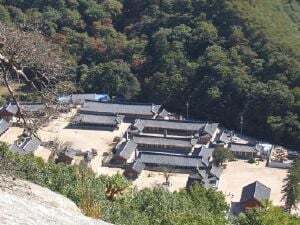 In the eighth century the Monk Jinpyo founded Geumsan Temple as a Seminary for teaching the Three Yonghwa Sermons, followed by followed by Beopjusa Temple as a second Seminary and Balyeonsa Temple on Mt. Geumgang as a 3rd Seminary, thus these three temples are known as the central teaching temples for the Three Yonghwa Sermons. 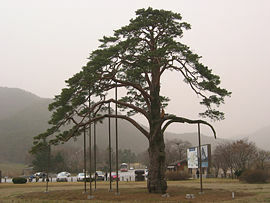 Pine tree that bowed to King Sejo. Holy Relics. It is said that in the eleventh year King Gomin's reign, the king was inspired by the spirit of Beupjusa and sent an Imperial envoy to Tongdosa ordering that some of the holy relics be sent from Tongdosa to Beopjusa, and that are enshrined in a reliquary behind Sujongbong and Neunginjeon. Legend states that Taejo, the founder of the Joseon Dynasty retired to a spot near Beopjusa frustrated by his sons' fighting for power. It is also said that King Sejo of Joseon directed that renovations be made on the great temple Beopjusa on Songrisan Mountain, after he had a mystical experience with a pine tree near the entrance of of the Temple. Sejo, the second son of Sejong the Great gained the throne by murdering his nephew; later in life he was afflicted with a skin condition and went to the Songrisan Mountains to search for healing of his body and spirit. On the way to Beopjusa, he encountered two young boys who called him "Grandfather" who were traveling with his daughter, Princess Uisok, who had tried to prevent Sejo from killing his nephew, and then fled afterward, in fear for her life. King Sejo begged for her forgiveness, but she was still afraid, and rejected his invitation to return to the palace. However, the pine tree bowed its branches in front of Sejo in recognition of his repentance. Palsangjeon Pagoda, the oldest wooden pagoda in Korea. Palsangjeon Pagoda (팔상전 捌相殿) Eight Paintings Pagoda, a large wooden pagoda, was originally built in 553 when the temple was founded. A copy of the pagoda was built in Nara, Japan, 50 years later, and is still standing. The Palsangjeon Hall currently at Beopjusa is a reconstruction dating from 1624 and has been preserved since that time, making it the oldest wooden pagoda in Korea. Palsangjeon Pagoda has been designated National Treasure No. 55. The five-story pagoda has large murals describing Sakyumuni Buddha's life. A walk around the hall gives Buddhists the chance to remember the important events in Buddha's life. In addition to the paintings, there are fours statues of Sakyamuni, facing different directions, with different hand positions—fearless in the Buddha facing east, the west Buddha is Turning the Wheel of Dharma, the south Buddha is touching the earth and the north Buddha is lying down in a dying pose, very rare in Korea. The hall also features 500 small white statues of Buddha sometimes called disciples of Buddha, but they are really images of Buddha himself, made with the 32 aspects and 80 features of the Buddha, including curled hair, a bump on the head and long ears. Facing down at the pagoda is a 33-meter-high, 160 ton copper statue of the Maitreya Buddha. An earlier statue, made by Chinpyo was taken by Daewongun in 1872, and melted down to make money to help finance the restoration of Kyungbokgung. Work was started on a replacement in 1939, which was finally completed in 1964 with a donation from President Park. The current bronze statue was constructed in 1990, which was later plated with gold. A rainbow mysteriously appeared in the sky when the new statue was dedicated. Beopjusa Temple in Naesongni-myeon, Boeun County, in the province of Chungcheongbuk-do, South Korea is is one of 25 district headquarter temples for the Jogye Order of Korean Buddhism, Korean's largest Buddhist sect, with 27 temples under its supervision. Currently, the Beopjusa Temple complex has about thirty buildings, and hosts a Songnichukjeon Festival every year in April of the Lunar calendar. The temple is home to four national treasures (one now has been moved to the National Museum of Korea, Seoul) and a number of local treasures. Golden Maitreya Statue, 33-meters-tall, built from 1986-1990 to replace a 27 meter concrete statue which had structural problems. The bronze Buddha was later covered in gold leaf and powder. A 2.7 meter iron pot, large enough to cook 80 sacks of rice, which is reported to have been used to serve the 3,000 monks and pilgrims housed at Beopjusa during the Goryeo Dynasty. Statues of the three dieties in Daeungjeon Hall (대웅보전 大雄寶殿 Hall of Great Light), built in two stories, one of the largest Buddha Halls in Korea, a shrine to Vairocana, Sakyamuni and Rochana. Ssangsajaseokdeung(Two Lion Stone Lantern) (쌍사자석등) with two standing lions, sculpted in great detail, holding the stone lamp. National Treasure No. 5. Iljumun Gate, the first entrance gate on the path to Beopjusa from the Songrisan Mountain National Park. A large water basin in the shape of a half-opened magnolia flower, National Treasure No. 64. Geumgangmun, at the main entrance into Beopjusa Temple. A special golden path covered with pebbles of baked yellow earth leads through the forest on Songrisan Mountain to the entrance of Beopjusa temple. A picture of Buddha sitting on a lotus flower, carved in rock. Memorial Stupa for the Most Reverend Jigwang of Beopcheonsa temple, National Treasure #101, now housed in the National Museum of Korea, Seoul. Asian Historical Architecture: Beopjusa Temple. This page was last modified on 2 June 2016, at 16:09.